Better transit won’t just happen. We don’t have unlimited funds or unlimited time. So, it’s important to create a plan and prioritize how we want to improve transit and improve people’s ability to get to where they need to go in the New Orleans region without a car and regardless of income level. Many other US cities have created community-supported long-range plans to bring specific improvements for riders. If other cities can do it, then New Orleans – with a much stronger tradition as a transit city – should be able to as well. 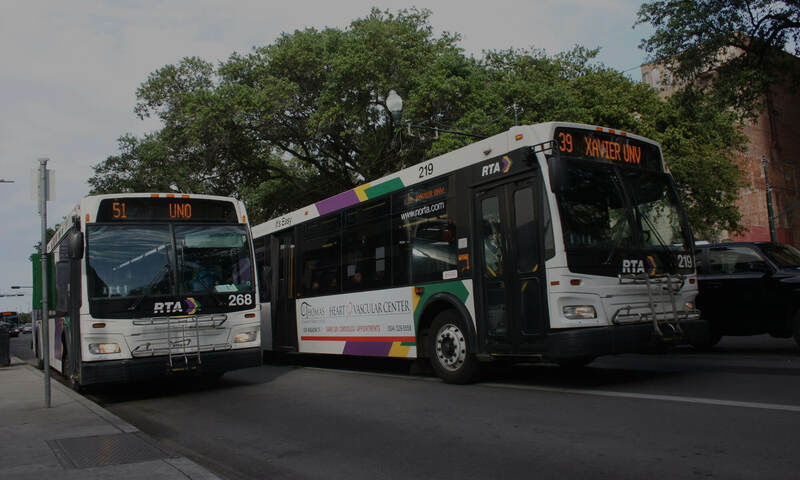 Fortunately, after a multi-year push from Ride New Orleans and other advocates to create such a plan, the RTA has determined to move forward. Over the course of 2017, this important plan will be constructed. The RTA is referring to it as the “Strategic Mobility Plan,” and Ride New Orleans wants to ensure that transit riders and residents can shape the plan so it brings the best possible results. January saw one of the first important benchmarks – public meetings to talk about rider visions for the system and begin to set expectations for what to expect. An open house on January 17 brought out more than 80 people – many of them alerted to the meeting by Ride New Orleans – to move through a series of interactive stations. The stations gave participants a chance to share their big-picture vision and values for NOLA transit as well as choose from a variety of key focus points. “Improving the existing system” garnered the most votes on January 17. Between now and the end of March, there will be a series of smaller meetings – often as agenda items on other organizations’ regular meetings – and “pop up” meetings outside busy transit transfer areas. Those will help to gather additional input on the overall direction the system needs to go. Ride New Orleans has asked for more public notice for these public meetings. As we receive more info on dates and places we will share it. There will be an opportunity to weigh in with the RTA planning team at our February 15 West Bank transit forum, so RSVP today! Research and analysis: March and April. The RTA planning team will take a deep dive into the numbers and analyze our service levels, current and anticipated needs and travel patterns, available and potential resources, and national trends. This will be mostly behind-the-scenes, but will set us up for the next stage. The Big Picture: April through July. The public conversation will shift to big picture goals and strategies to accomplish those goals. The discussion will be sparked by the public feedback from the first round and the research and analysis from the previous stage. This will be a very important stage for riders to be involved in and we will do our best to make sure everyone who wants to participate is able to do so. Options: August and September. After establishing an initial consensus on goals, the process will focus on forging consensus on the choices we need to make to actually accomplish those goals. Ride New Orleans think this will be the most important stage. How we choose to spend our finite resources is one of the most crucial and needed parts of this process and riders must have a loud and clear voice in deciding. Final version and beyond: The rest of 2017 and into 2018. A draft version of the strategic transit plan will be created from the input of the previous stages. Residents will be able to comment on specifics and then there will hopefully be a community-supported revised version which the RTA board will approve by the end of the year. But the work won’t stop then – Ride New Orleans and transit riders will keep pushing to make sure that there is a clear implementation plan, accountability with defined checkpoints, that immediate steps are taken, and that the new mayoral administration is fully vested in the plan. Ride New Orleans thinks that the most important priority for our transit is that it allows New Orleans residents get to where they need to go quickly and affordably. Right now, your average New Orleanian with a car can reach 89 percent of the region’s jobs in 30 minutes or less. But if the same New Orleanian is reliant on transit she can only reach 11 percent of those jobs in the same 30-minute period. That’s unacceptable and the strategic transit plan must prioritize how we get New Orleans residents quickly to work, school, and other important places via public transit. Be creative: New transit lines or adjusting existing service can open up new possibilities for riders. Also critical is a public process that is inclusive and sees the community and transit riders as full partners in choosing a path forward, and the checkpoints that will help us determine how we’re doing in getting there. Ride New Orleans is focused on keeping riders informed and engaged as this process unfolds in 2017. Sign up for our email updates and follow us on Facebook and Twitter in order to get information as quickly as we have it. In addition, you can regularly check the RTA’s Strategic Mobility Plan homepage at http://www.norta.com/About/StrategicPlan. Thus far, they haven’t put as much information on the page or updated as regularly as we would like, but we hope to see more regular updates in the near-future. Previous PostPrevious Make your voice heard! Next PostNext West Bank Transit Forum this Wednesday!